As I write this, people all over the world have just taken part in a two minute silence to mark the moment that the guns of the Great War fell silent on the Western Front. Lest we forget. There was, however, another significant moment of history that passed this week largely unnoticed – The fiftieth anniversary of the abolition of the Death Penalty for Murder.¹ Funnily enough, If you go even further back, to 1865 to be precise, it is actually 150 years since the last public hanging in Durham, that of Matthew Atkinson – a subject of several previous blogs. In the strangest turn of events, I found myself at the site of his death this very week. In my former life (yes I haven’t been a student all my adult life!) I worked as a freelance filmmaker and ‘creative’ (an awful catchall phrase for any job that’s remotely artistic). Recently I have picked up a few commissions and one of them was to work with an engineering firm in the North East on a collaborative project with artist Elisa Artesero. The firm have built and engineered Artesero’s Dreamers installation (pic above) for the fantastic Lumiere Festival in Durham (a must see piece and event). It is situated at the Durham Crown Court gardens and as I drove up to the site of the installation my PhD brain suddenly kicked in and I realised where I was. Durham Crown Court was the site of executions in Durham after 1816 and the gardens where the installation is located would have been where thousands gathered to watch the awful final moments of the doomed men and women. I remembered reading newspaper reports, long after the scaffold was removed and executions moved inside the prison walls (1868), stating that you could still see evidence of where the scaffold had been. So I went looking and sure enough there were indeed signs. Durham Crown Court entrance. Directly above the door to the right and left you can see two, small block squares (marked by red arrows). These were the holes for the beam supports for the scaffold. A macabre reminder, to all who enter, of the punishments their forebears may have faced. The window above the door was the point from which the condemned would step out from onto the platform, as described in the executions below. Funnily enough the man in shot was coming to tell me to clear off until I explained what I was studying and he spent five minutes eagerly confirming all suspicions about the building marks. When I returned home I dug out my ‘execution press’ folder (I bet you don’t have one of them!) and found some reports for the first execution on this new scaffold. Helpfully, they give a very clear picture of how they unfolded. Unlike previous executions in the region, the Durham Court scaffold was the first one to employ a ‘drop’ system. Previously the condemned were placed on the back of a cart or on a ladder, which was driven or kicked away respectively, leaving them to dangle from the noose and die a slow and painful death. The drop system introduced a sort of bolt operated trap door, on which the condemned would stand and eventually fall through – in theory, causing instantaneous death (though rarely the case in practice). In this report of the first execution on this new site, that of John Greig, we get a clear picture of the operation. THE EXECUTION – On Saturday morning last, at 9 0’clock John Greig, the wretched culprit, convicted of the murder of Elizabeth Stonehouse, was executed in this city. 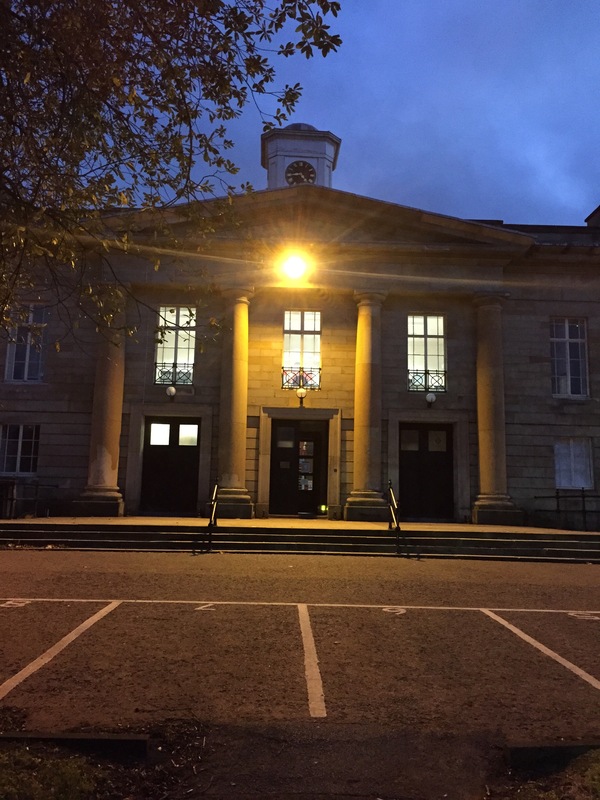 The new drop was erected upon the steps in front of the county courts, and the platform being upon a level with the centre window of the Grand Jury Room, the unfortunate man entered upon the fatal scaffold from that window, preceded by the Under Sheriff and the Governor of the Gaol, and followed by the Rev. Robert Blackett, the executioner and two bailiffs. He prayed fervently for some minutes with the Rev. Clergyman, then shook hands with those around him, expressed a hope that they should meet in heaven, and with the utmost fortitude submitted to the hands of the executioner. In this melancholy detail it affords us satisfaction to state, that the execution was performed in a manner highly creditable; the Under Sheriff paid the utmost attention to the proper adjustment of the rope, and when the platform fell, the unfortunate man was seen to make but a single motion with his hands as life departed. He did not appear to notice the populace assembled to witness the execution, but left a letter addressed to his friends, acknowledging the justice of his punishment, and that every attention had been shewn (sic) him. In the above passage we see that the condemned man was led through the windows above the doors, onto the scaffold. From this vantage point Greig would have seen the multitudes assembled, although he appears not to have noticed them. Several papers, including The Times no less, reported that the large crowd appeared to have every sympathy for Greig’s plight. On Saturday morning, in pursuance of his old sentence, John Greig was executed upon a new drop, erected in front of the new County-Court-house, in the presence of a vast number of spectators, who appeared to have a strong feeling for the unfortunate man. He behaved with – decent fortitude highly becoming a person in his situation. An immense crowd had assembled at eight o’clock, in front of the New County Courts, to witness the awful scene. About a quarter before nine the executioner appeared on a platform erected on a level with the centre window of the grand jury room, and fastened the rope on the gallows, and shortly after the unfortunate man came out on the platform, and ascended the drop with a tottering step, supported by the executioner and Mr.Wolfe, the gaoler. The rope was immediately placed round his neck, and after the Lord’s Prayer had been said, the drop fell, and he died without a struggle. After hanging the usual time, the body was cut down and interred in the burying ground on the back of the prison. The “immense crowd” is estimated as “some thousands in the Durham County Advertiser (17th April, 1819). This was not an unusual size but, I imagine, owing to the nature of the crime that this was probably slightly larger than normal and possibly a less forgiving crowd. The Observer report adds other crucial details. It says that Atcheson “cried to heaven for mercy as he advanced to the gallows” and it mentions that he was buried in ground adjacent to the prison owing to the fact that his body was not “claimed by his friends.” This is despite him surviving a wife and ten children. Records of the ages of the executed are sometimes tricky to verify as they are often misreported, but Atcheson is certainly one of the oldest if not the oldest person to be executed in the region in my period of study, being variously reported as 67, 68 or 70 at the time of his death. His age did not go unnoticed. How truly lamentable it is to behold a man, in his 70th year, brought to an ignominious end from the want of education! And how strikingly does this case point out the necessity of instructing the inferior classes of society! One final point of interest near the gardens is this house (pictured below), now the home to the Durham University School of Applied Social Sciences. The grand windows and ornate iron balcony were often rented out to well-heeled members of Durham and North Eastern Society in order for them to gain a better view of the execution. This was a common practice at executions, particularly in London, notably Dickens often rented houses with great views of the scaffold when attending executions. No. 30, Old Elvet, Durham. This house sits just across from the Durham Crown Court Gardens and its ornate iron balcony was often rented out to the better off members of North-Eastern society to get a better view of the execution spectacle. It is currently home to the Durham University School of Applied Social Sciences. I am due to return to the site on Sunday, to film Artesero’s piece in its full glory. It is a work that plays with light, reflections and has a very ghostly, temporal quality to it – a fitting installation for a site with such a ghoulish past. The Death Penalty wasn’t actually finally abolished until 1998, crimes punishable by death after 1965 included treason and Arson in the Queen’s Dockyard. Long term readers of this blog will now that much of my work involves gibbets. These structures were placed in prominent places on the landscape to remind people of the wages of a life of sin and crime.These have long since become relics of a seemingly barbaric past, but I was reminded of them this week when I watched a BBC Imagine documentary about Anthony Gormley. 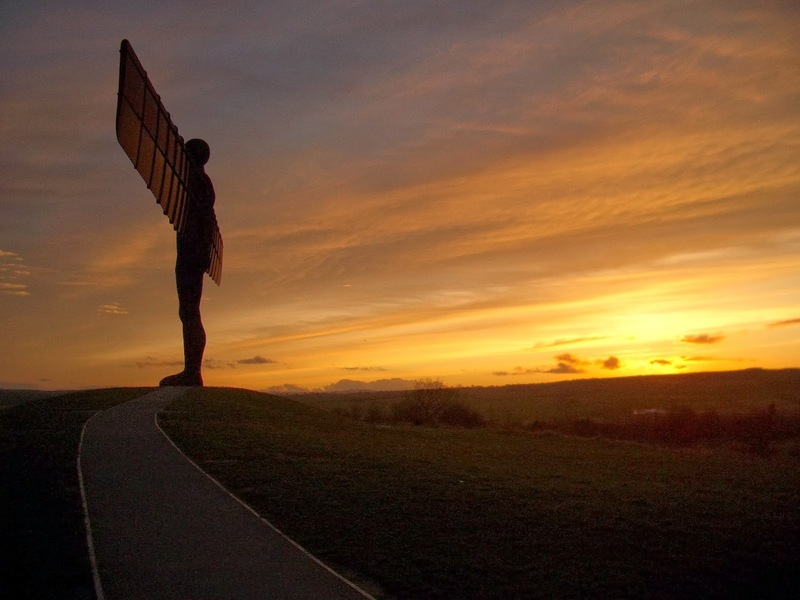 Famously Gormley created the Angel of the North and the documentary made me realise that, to my shame, I had never visited it. I have driven past it many times of the A1, but never actually seen it in the flesh, until this week (as I sped past it on route to the Dreamers site). The documentary was fascinating as it detailed the history of Gormley’s work and his fascination with the human body as a statement and piece of art in and of itself. He talked of his devout Catholic upbringing and eventual move away from the faith, in part a reaction to a trip he made to Lourdes, a famous site of pilgrimage, in which he was accompanying heavily disabled adults. A trip he found deeply troubling and led him to turn away from the faith, claiming it to be a “collective hallucination.” However, he said how marked his life has been by an attempt to replace that lost faith. If you were brought up a Catholic you may lose your Catholicism, but the fact is it has marked you for life and the absolute need to replace its belief system with something else becomes your life’s work. Being Human: Anthony Gormley – BBC Imagine. I was struck by the power of his sculpture and how his emphasis on the body and the spectacle of the body, chimed, in an odd way, with the criminal legislators of my period. They too knew the awesome power of the body as a spectacle and in many ways Gormley’s Angel of the North almost acts as a reclaiming of the public body, from a pained representation of justice enacted to a shining exemplar of human ingenuity. Gormley talks of it as a monumental structure. The Angel of the North is my attempt at a Stonehenge. It’s the attempt at marking a very particular place and a very particular time. Between the end of coalmining, the end of shipbuilding, the end of the industrial power of the North East and the dawn of the information age. Making a totemic object for a community that had lost faith in its own future. But it’s not to everyone’s taste, as previous Distractions subject Brian Sewell made abundantly clear. Not a work of art, a monstrosity…It’s about as engaging as the gigantic arms of Saddam Hussein on the way into Baghdad. They have exactly the same fascist [undertones]. I can’t understand how people don’t realise it is like a statue from almost every undemocratic regime. It has allowed all sorts of monstrous things to go up in public places. It has led to the conviction that if it’s big enough we will cower in awe. Well you can’t please everyone. Last year my comedy group had a big viral success with a parody of the Sainsbury’s WWI Xmas advert. As a result we were on high alert for the Xmas advert season this year. People were contacting us when John Lewis’ latest advert came out (#manonthemoon), which features a little girl who sees a lonely old man on the moon, as they thought it ripe for parody – they were right. However, sadly, we don’t have time this year owing to other very exciting commitments (of which more in future blogs). Instead, I can offer my favourite song involving the moon, it’s a beauty by Arthur Russell.